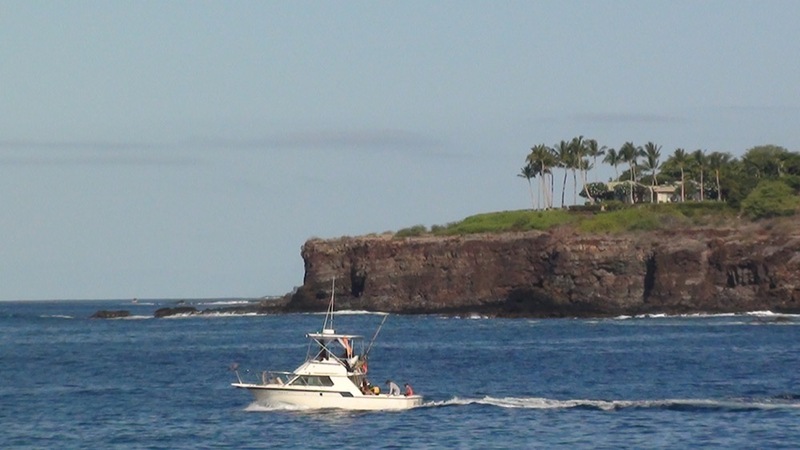 Hawaii’s “Pineapple Isle” is also Hawaii’s “Private Isle”. 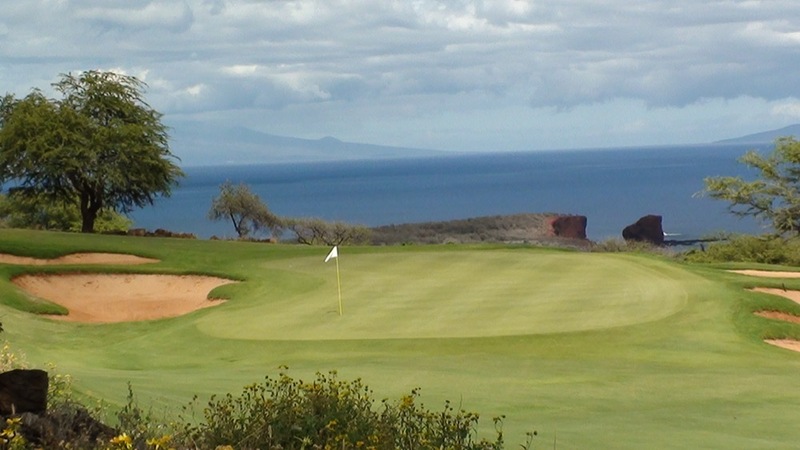 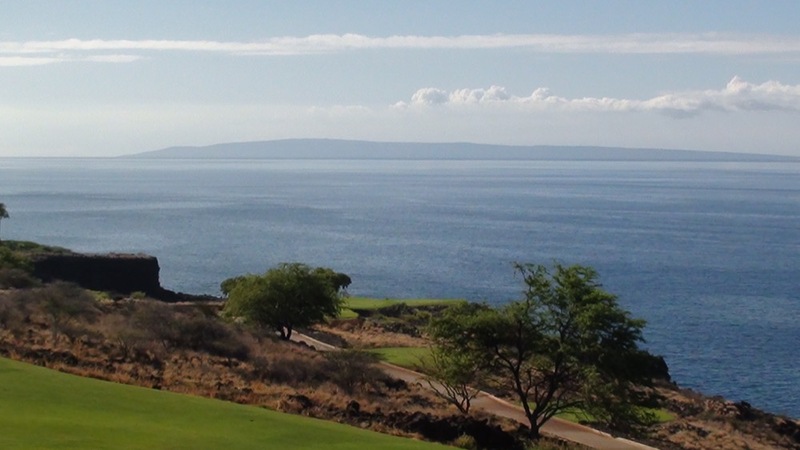 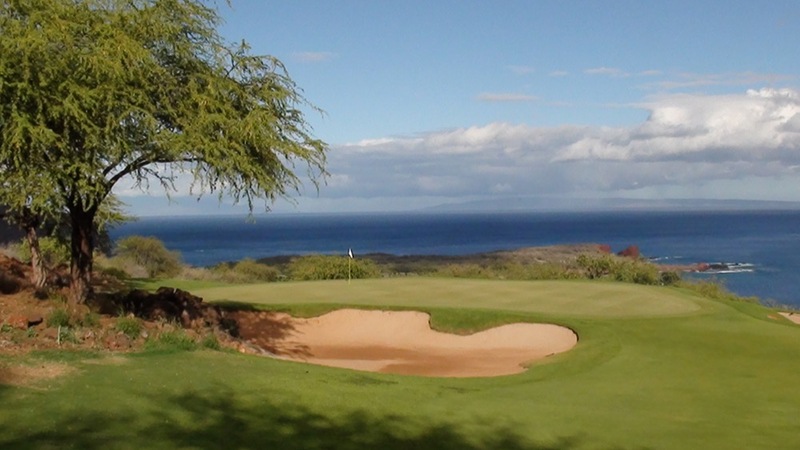 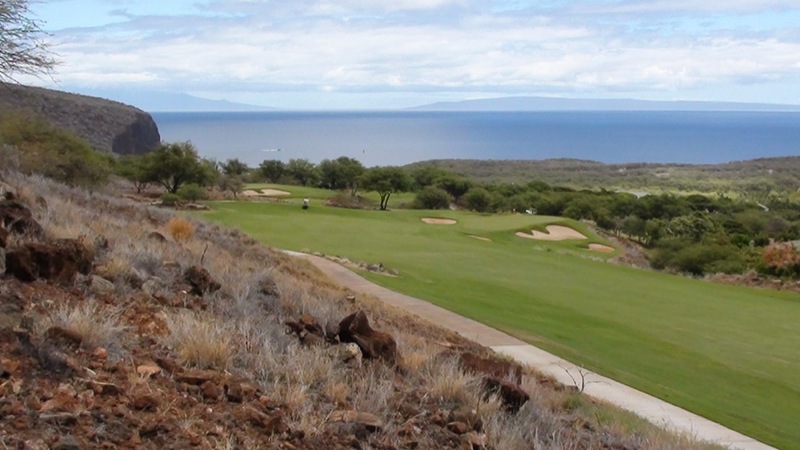 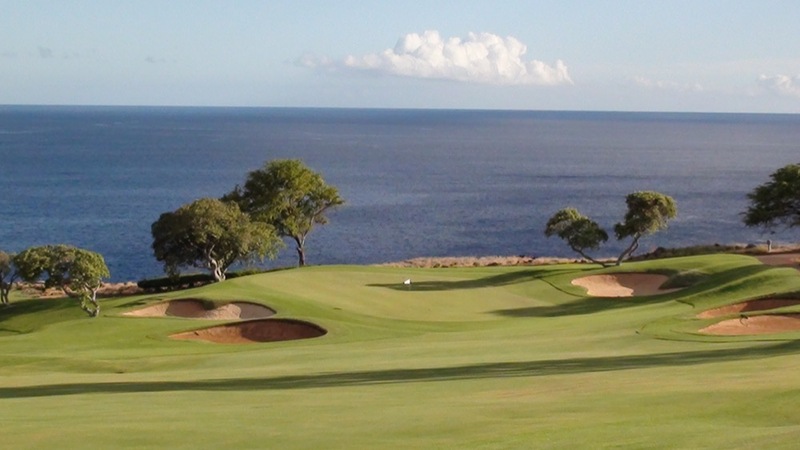 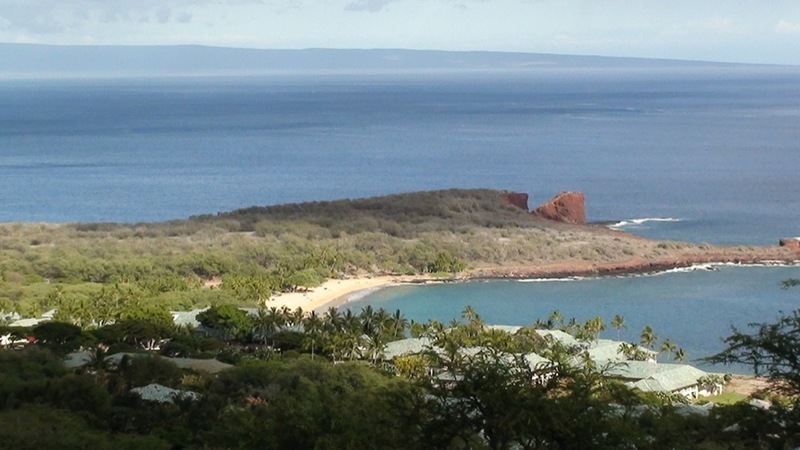 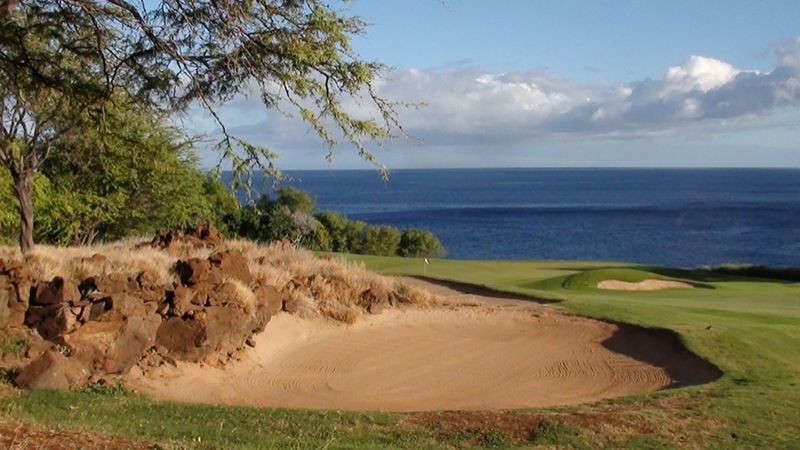 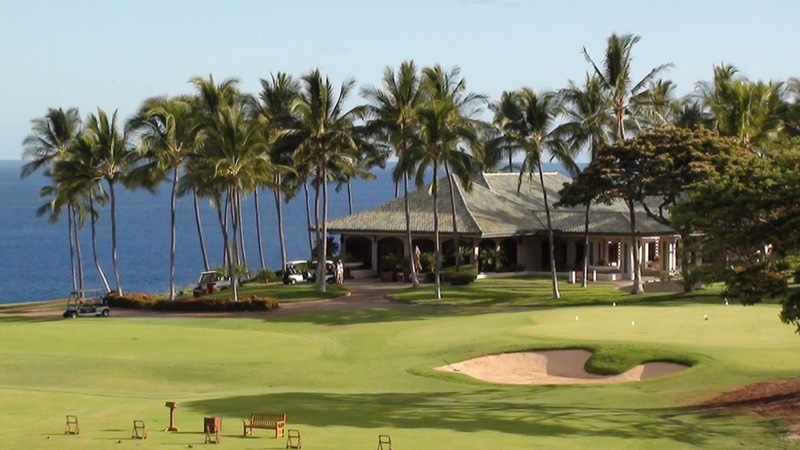 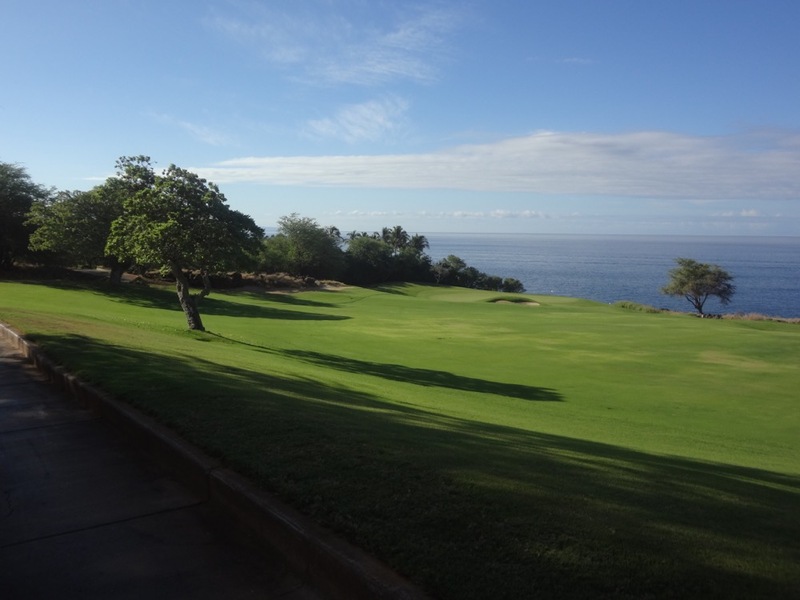 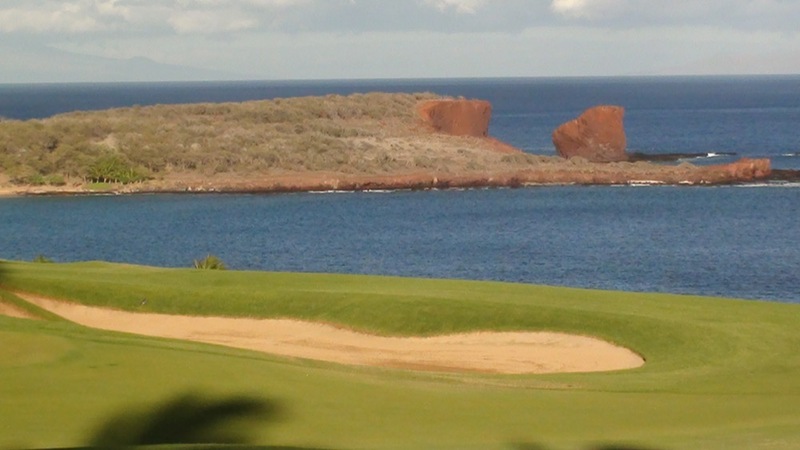 This is Lanai, which has a golf course so supreme that we almost hesitate to make news of it public. 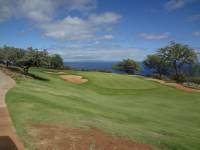 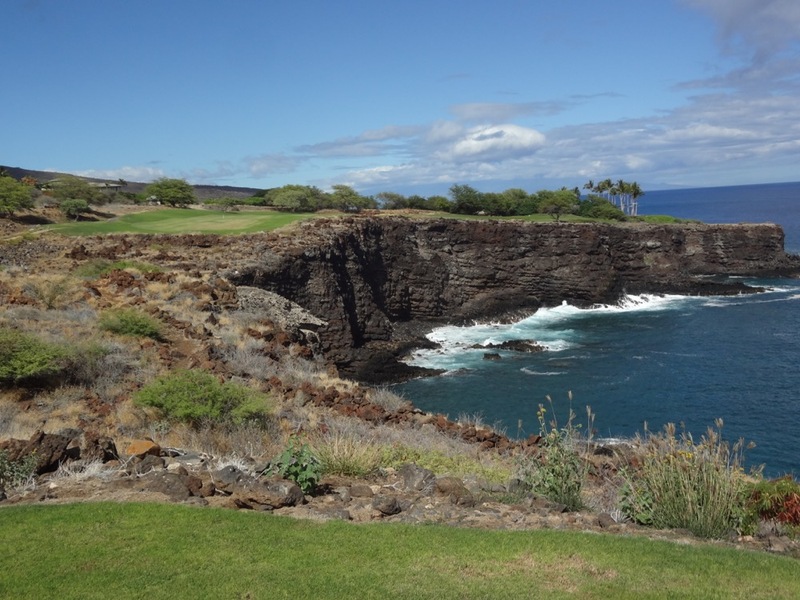 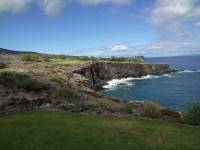 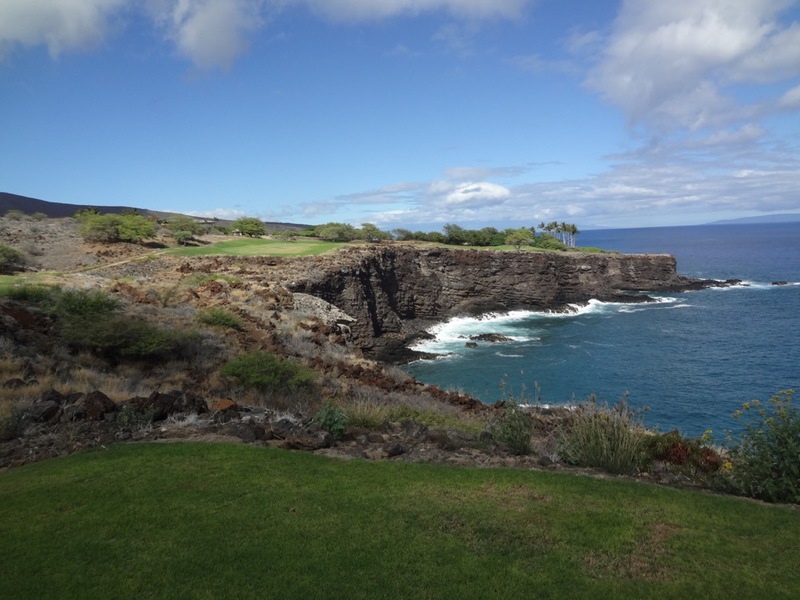 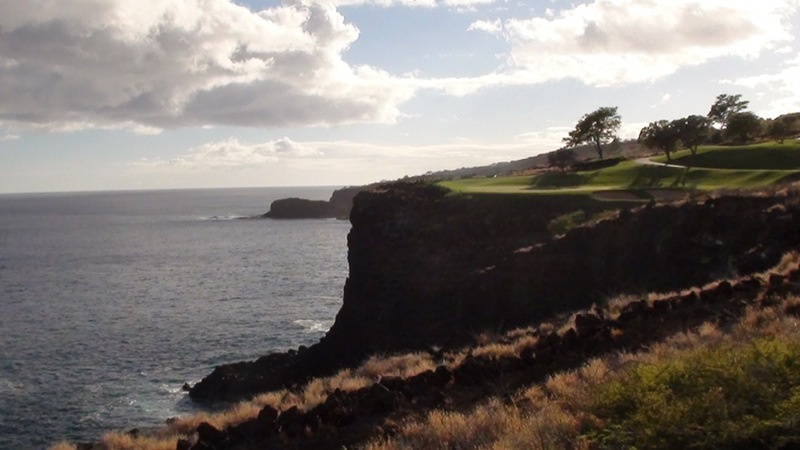 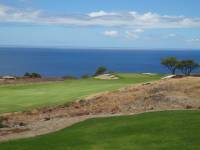 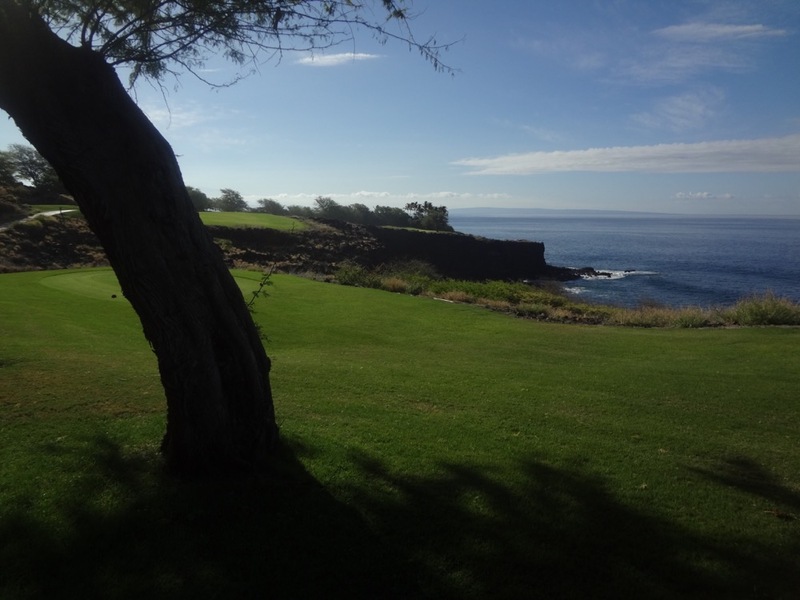 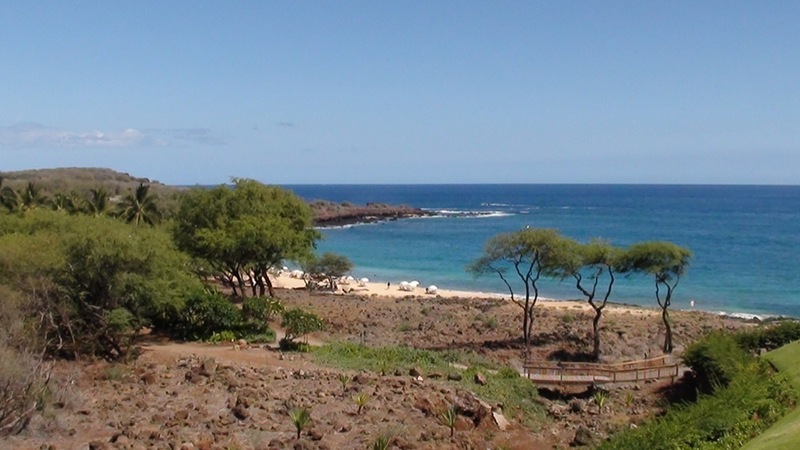 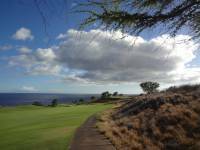 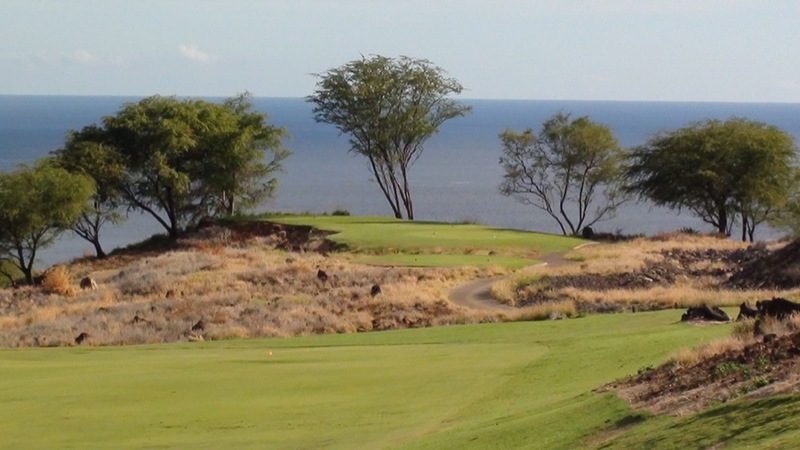 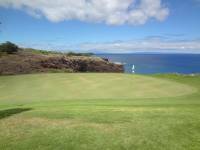 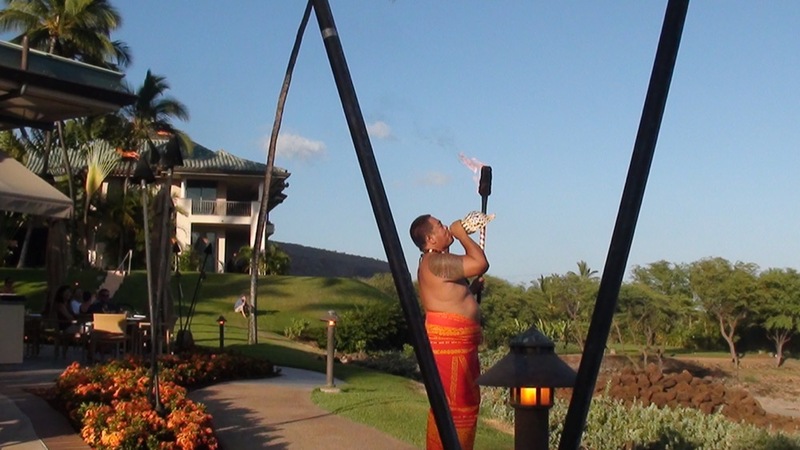 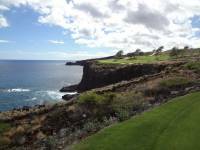 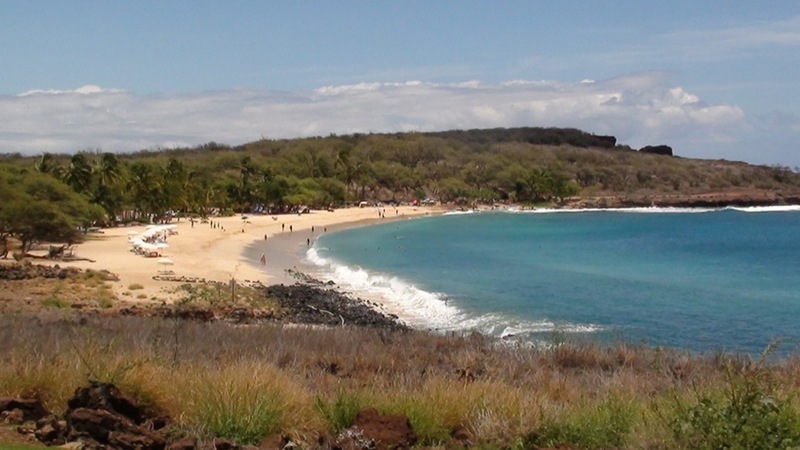 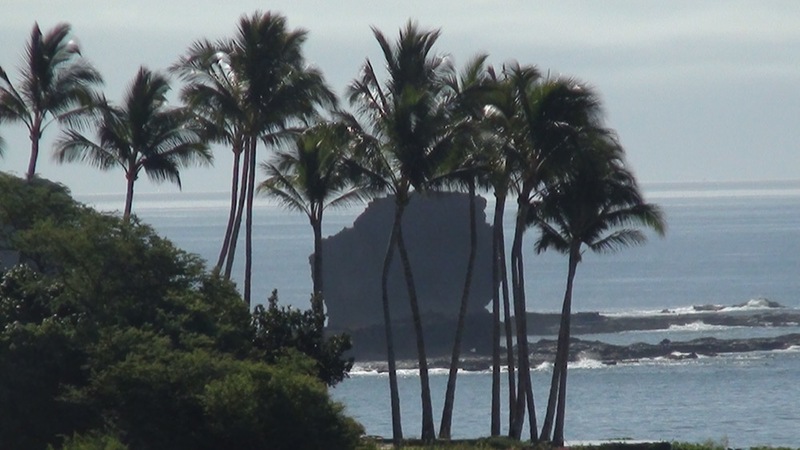 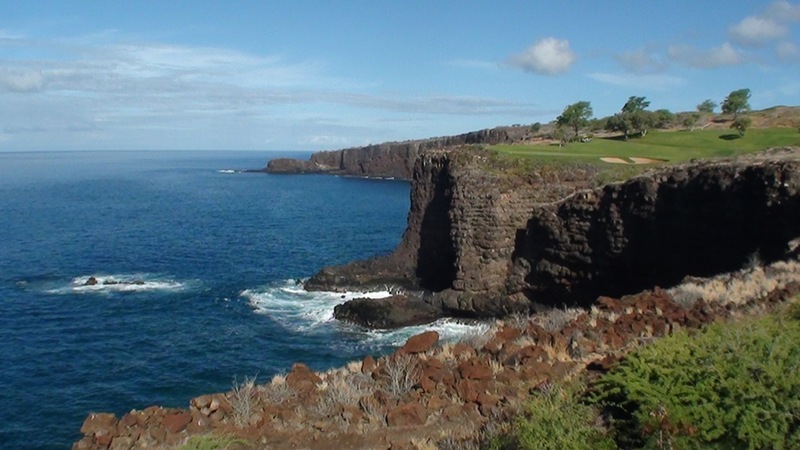 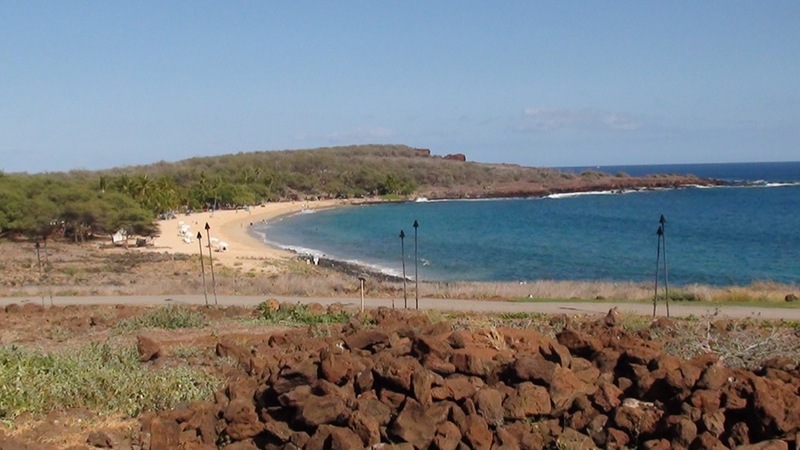 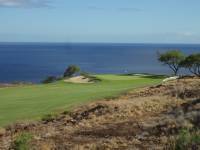 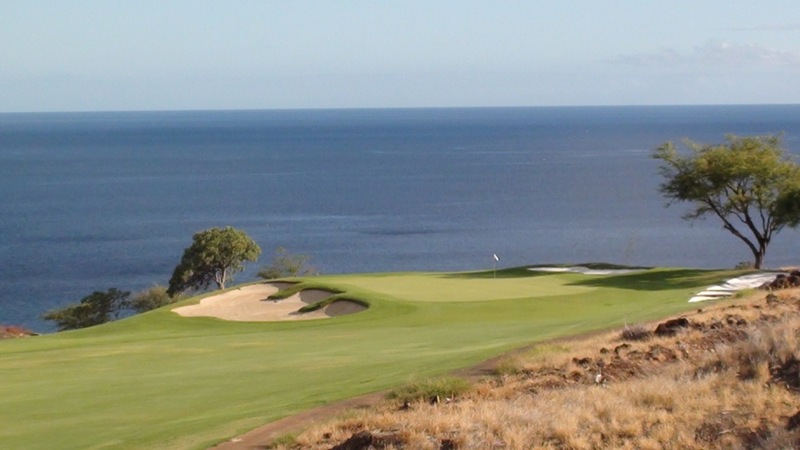 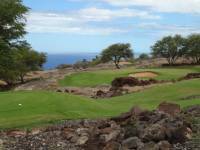 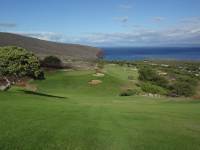 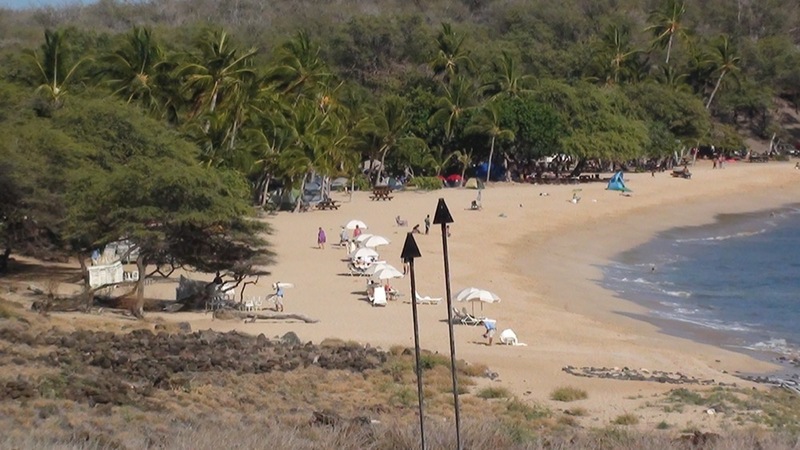 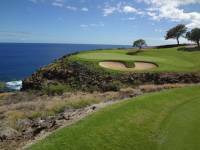 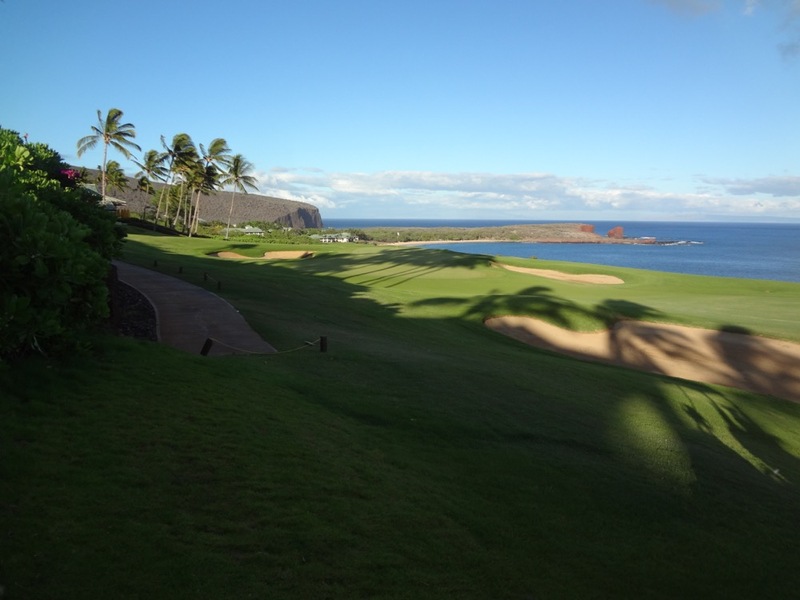 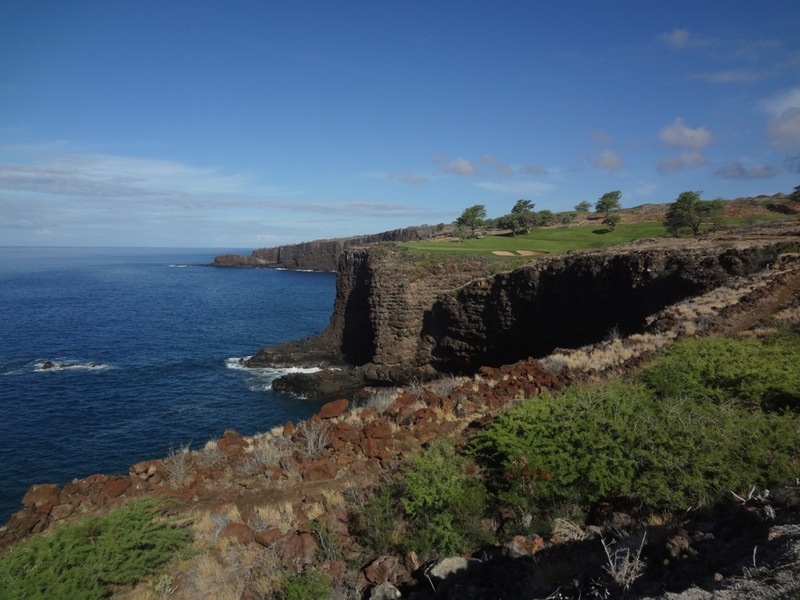 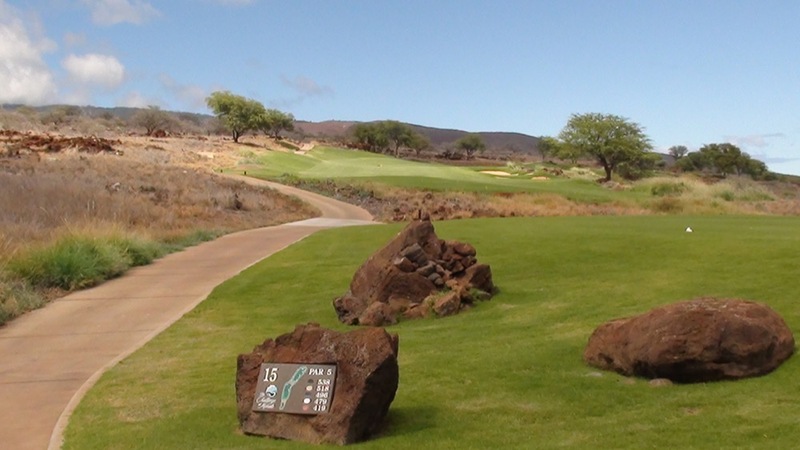 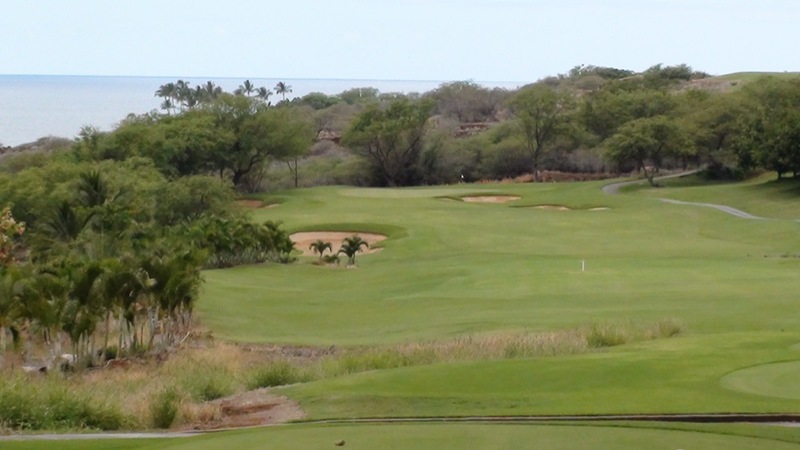 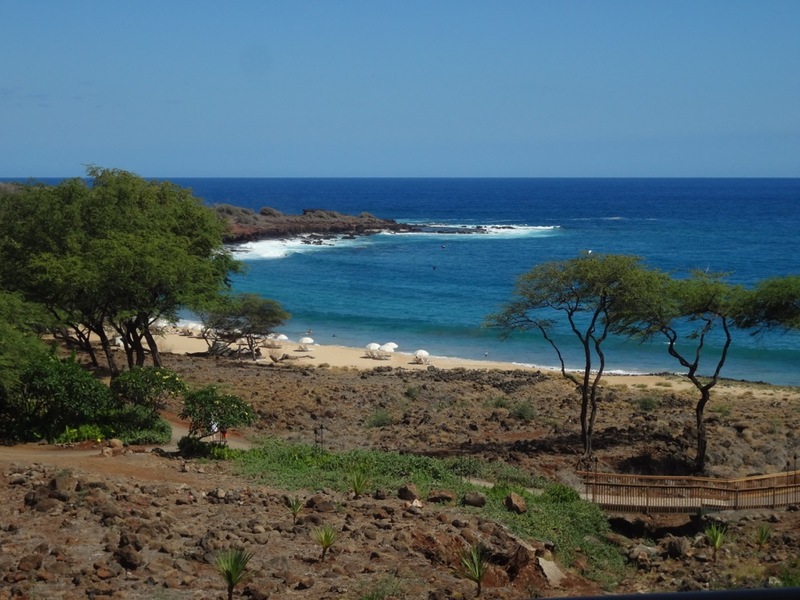 But Manele Golf Course at Lanai’s Manele Bay is just too good to keep it quiet. 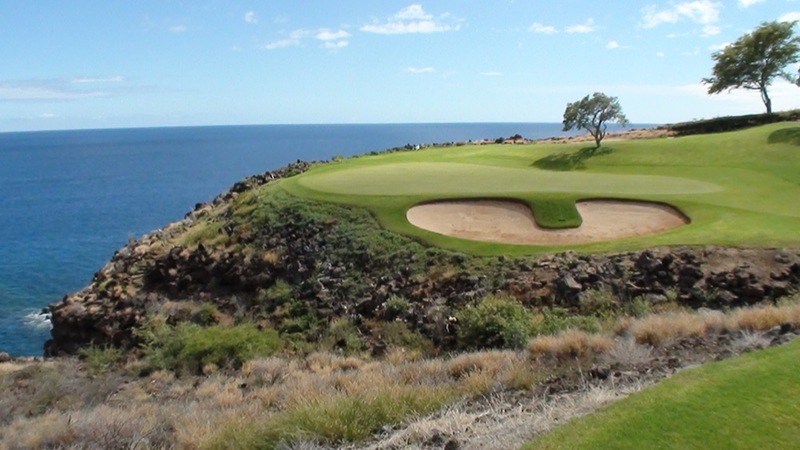 A bit of desert golf, with a huge dose of spectacular cliff top golf, The Challenge at Manele (as this Jack Nicklaus signature course was originally named) is one-of-a-kind. 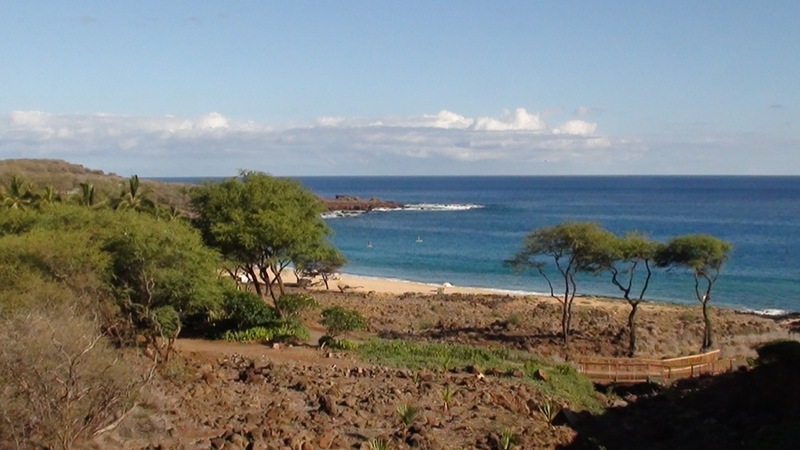 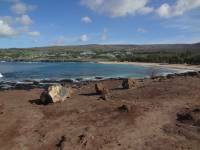 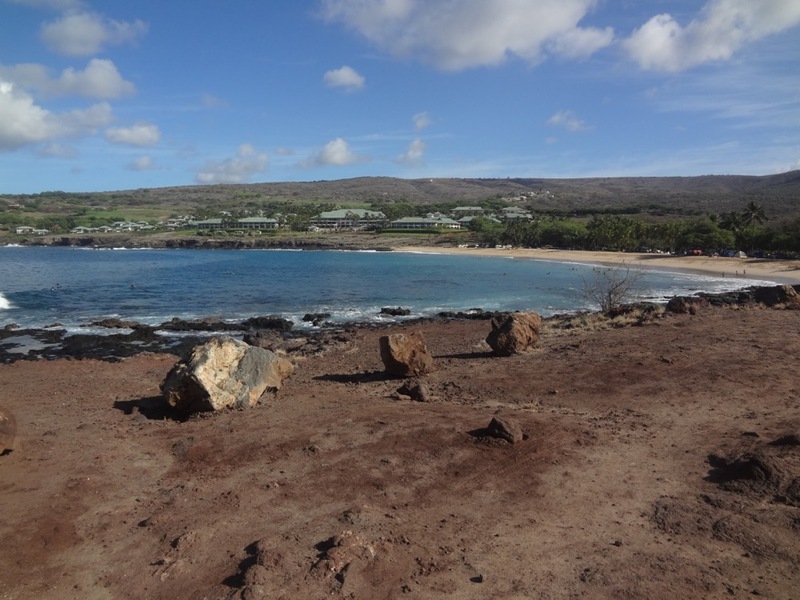 Not many know that the island of Lanai is not “lush and green” on the coast like Hawaii’s other islands and perhaps this is part of the reason that Lanai has remained somewhat hidden in comparison to nearby Maui (in fact, Lanai is actually part of Maui County). 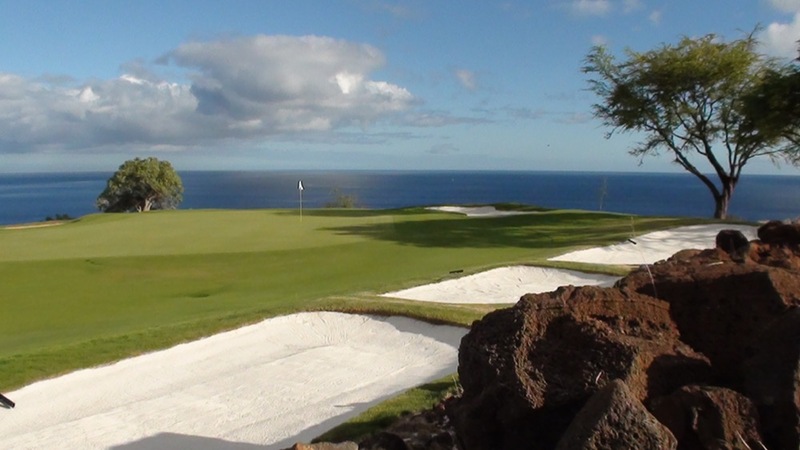 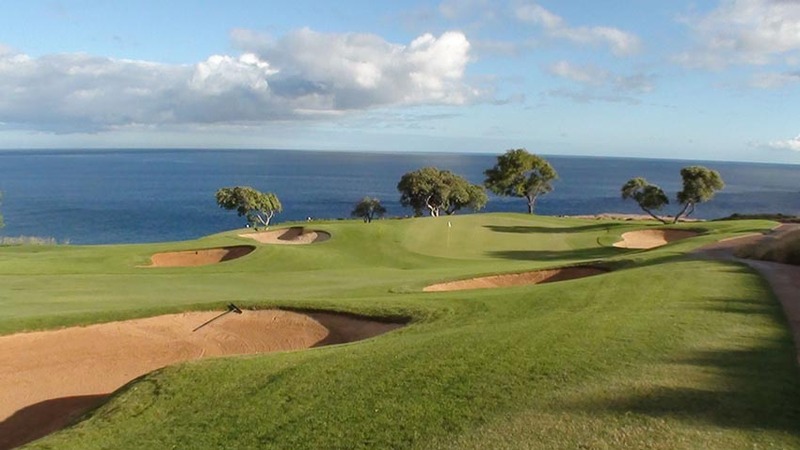 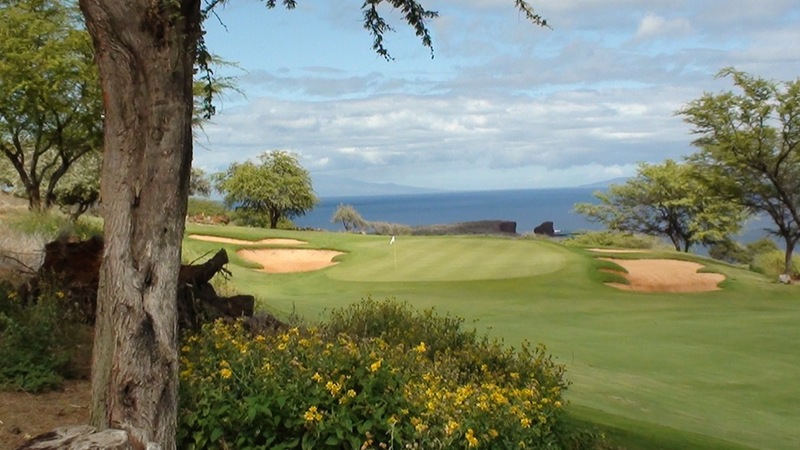 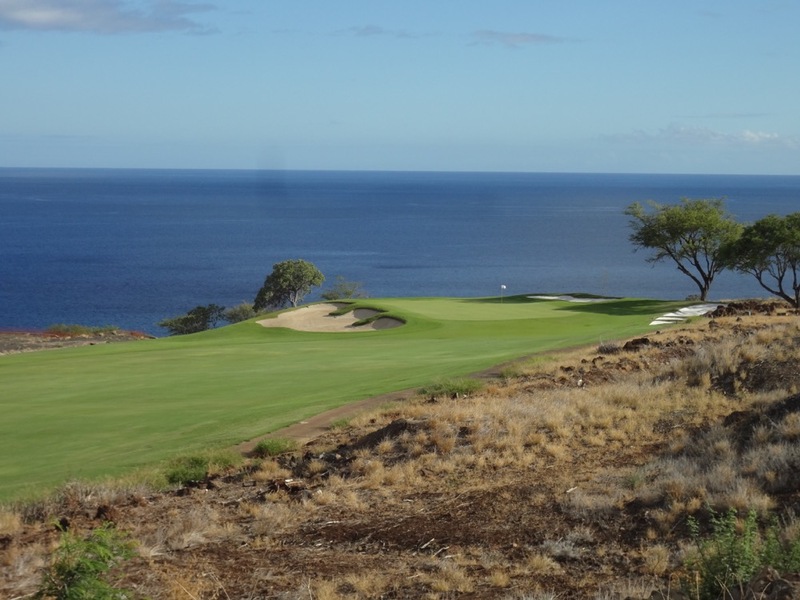 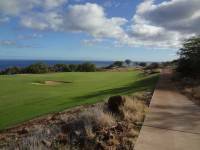 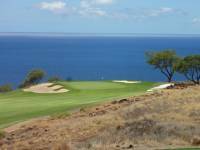 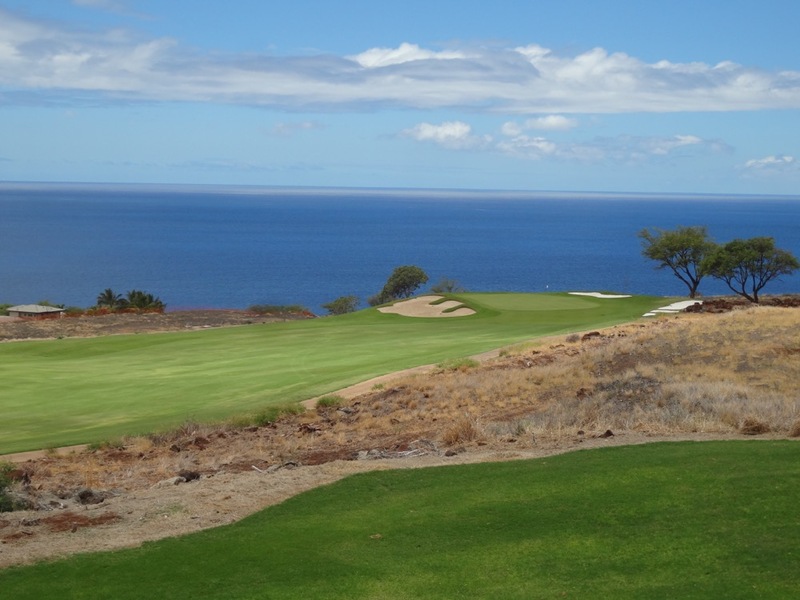 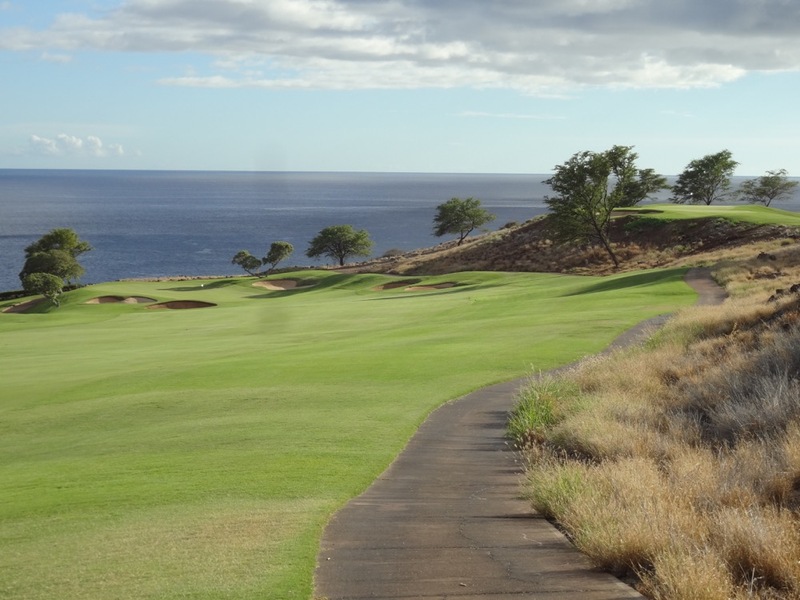 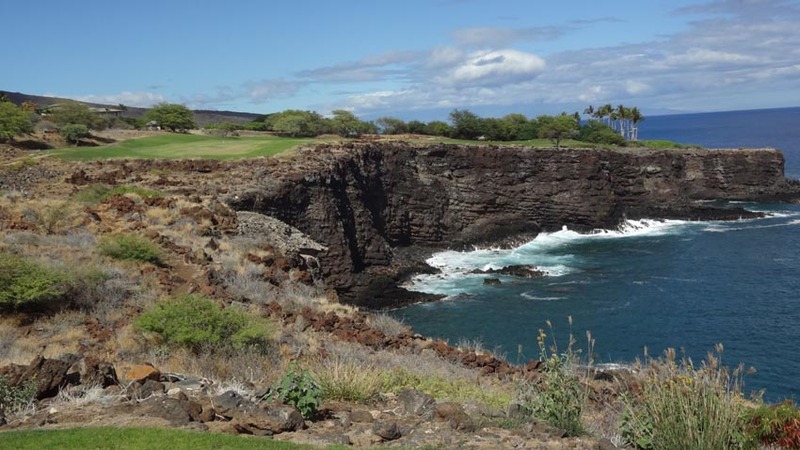 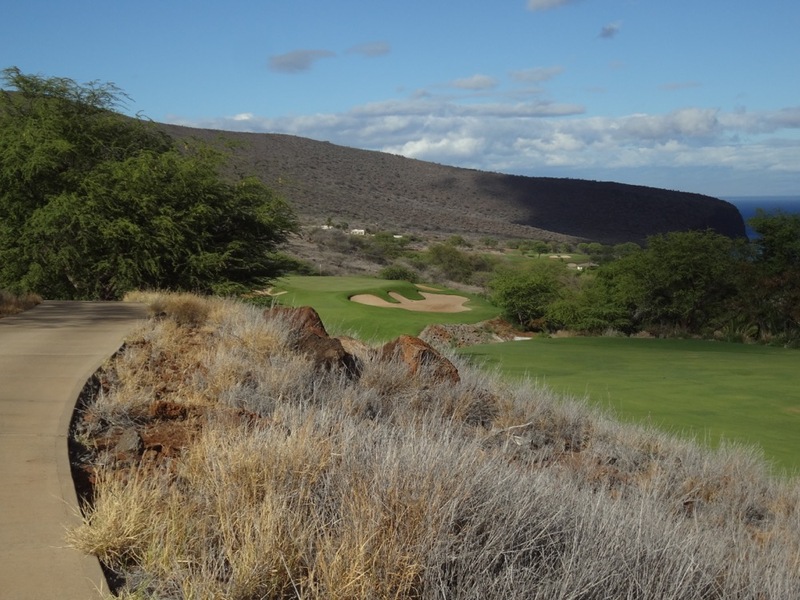 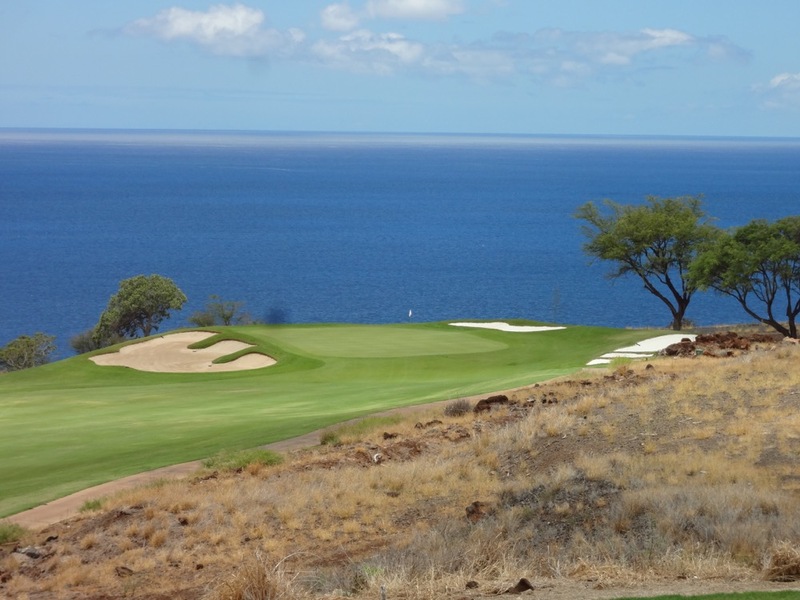 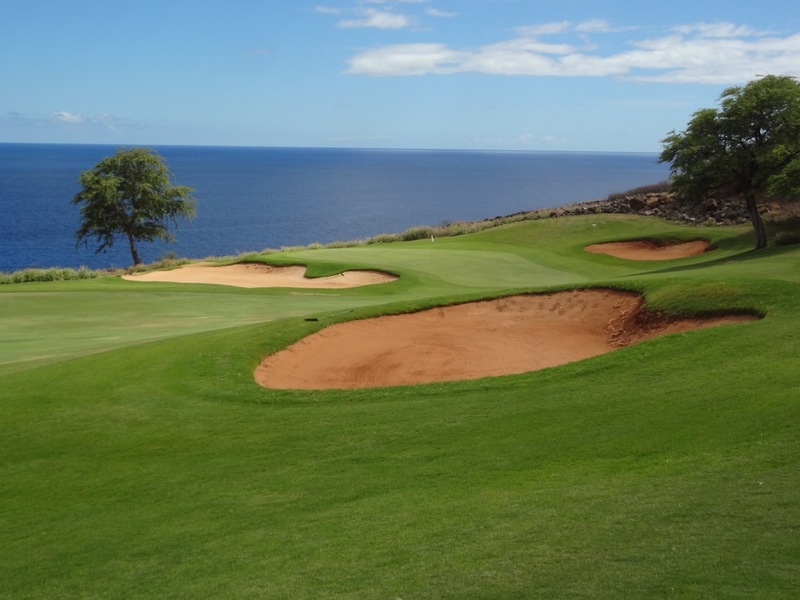 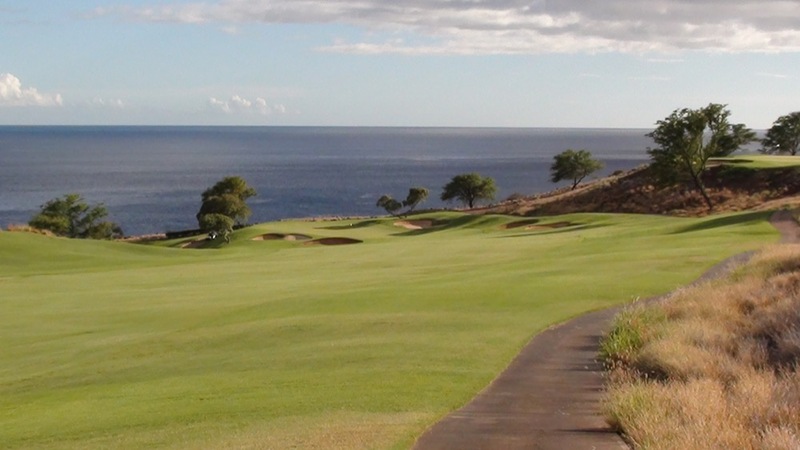 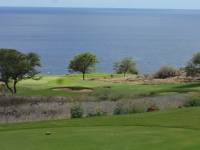 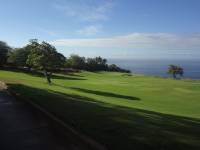 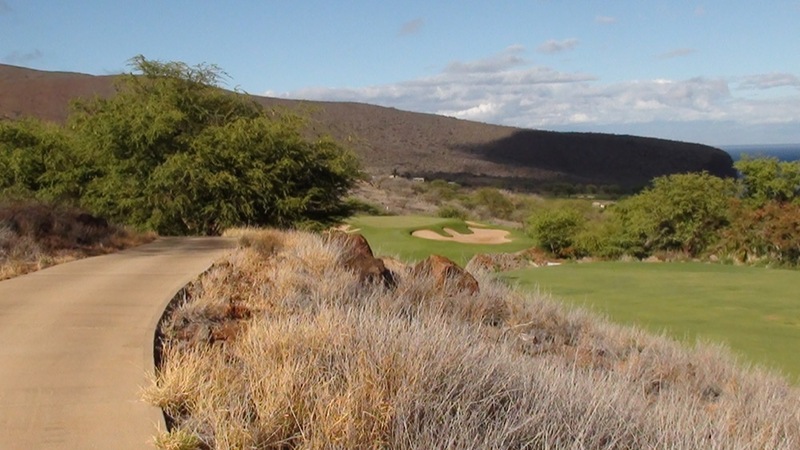 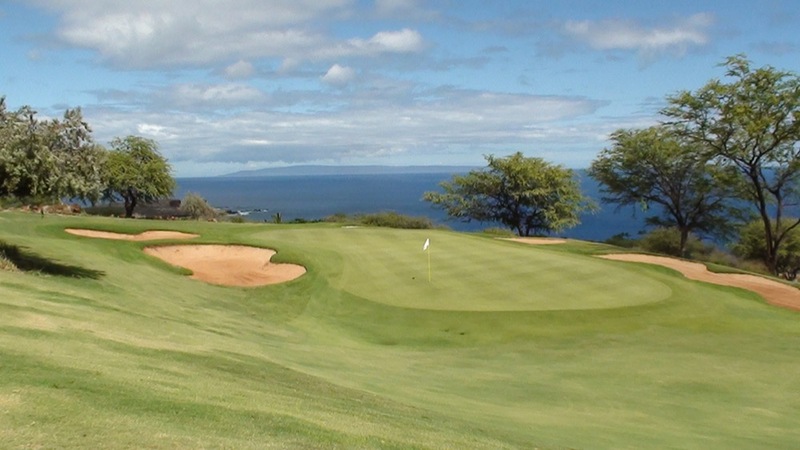 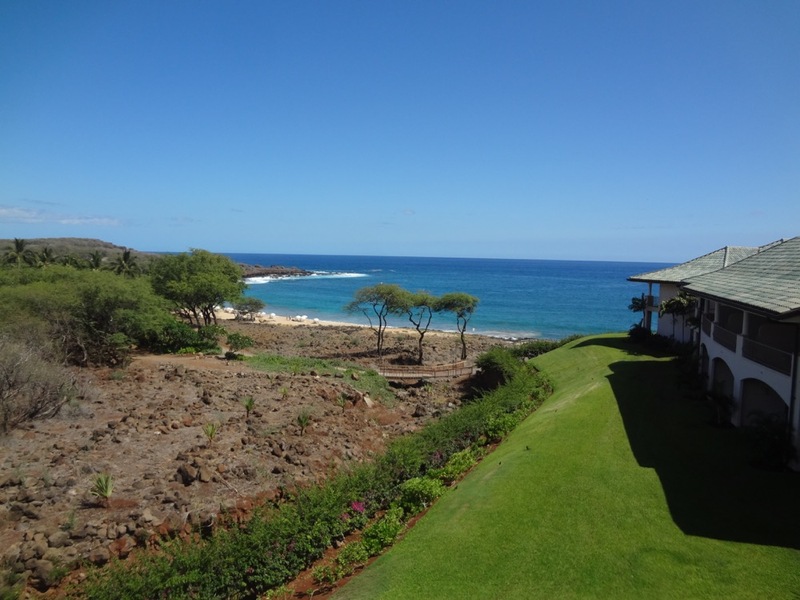 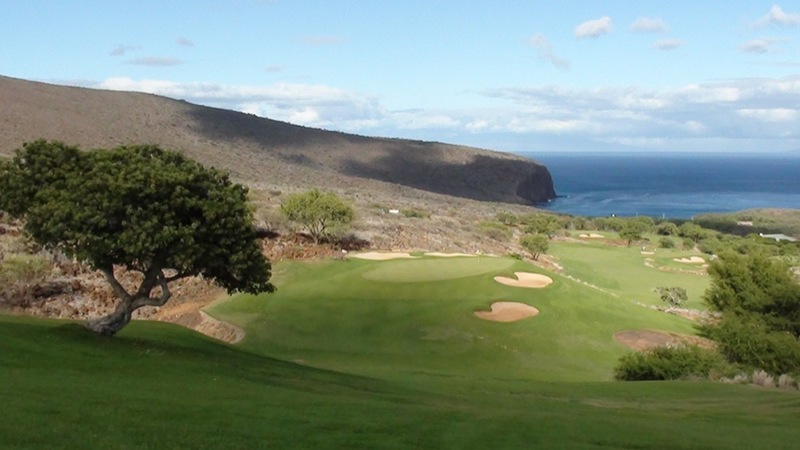 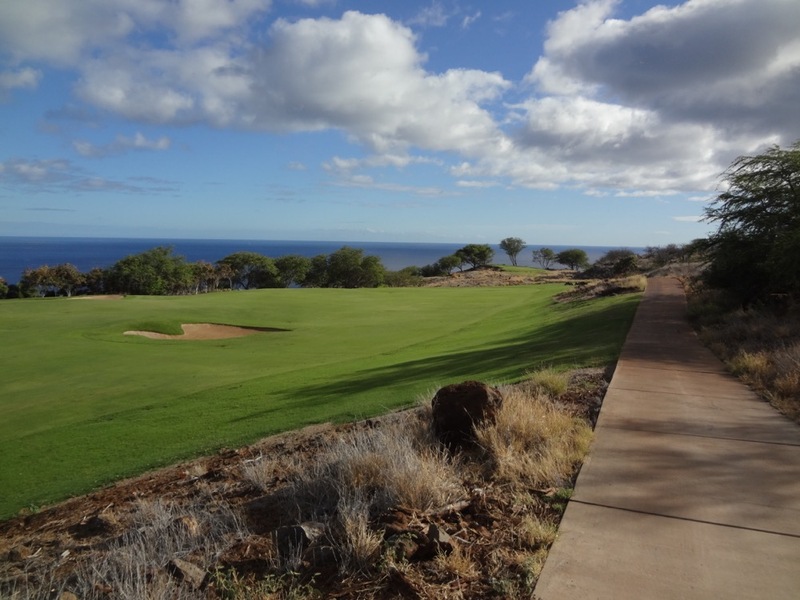 But what Lanai lacks in green it makes up for with sunshine and especially spectacular landscapes, none more so than the sweeping terrain of Manele Golf Course where it’s at least 500 feet from the top of the course to the bottom. 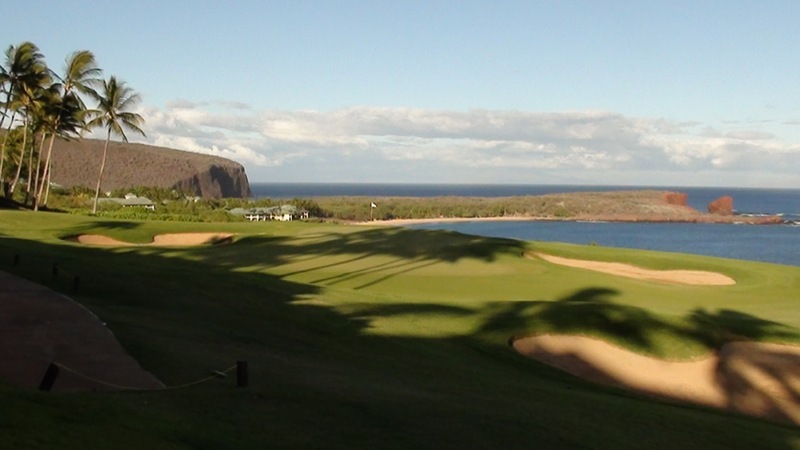 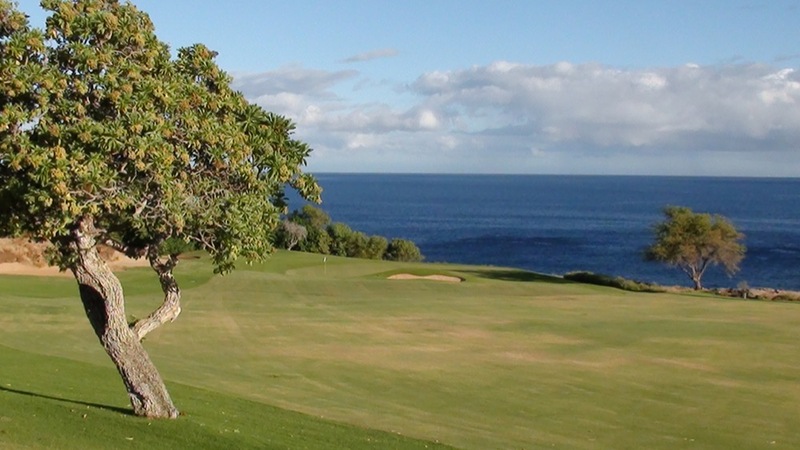 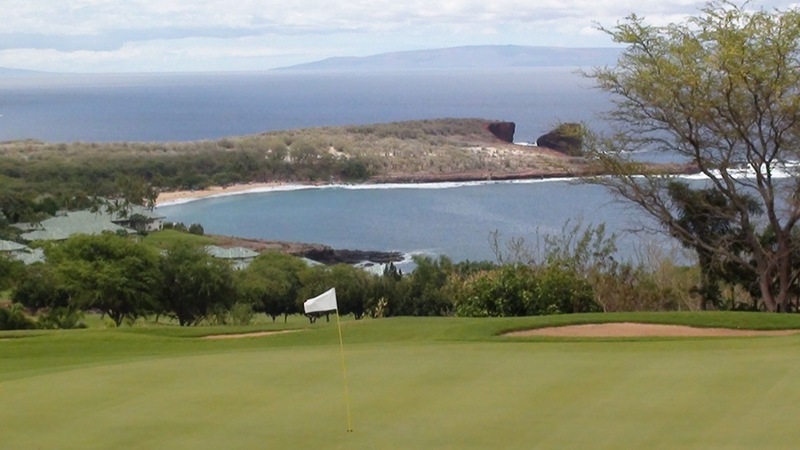 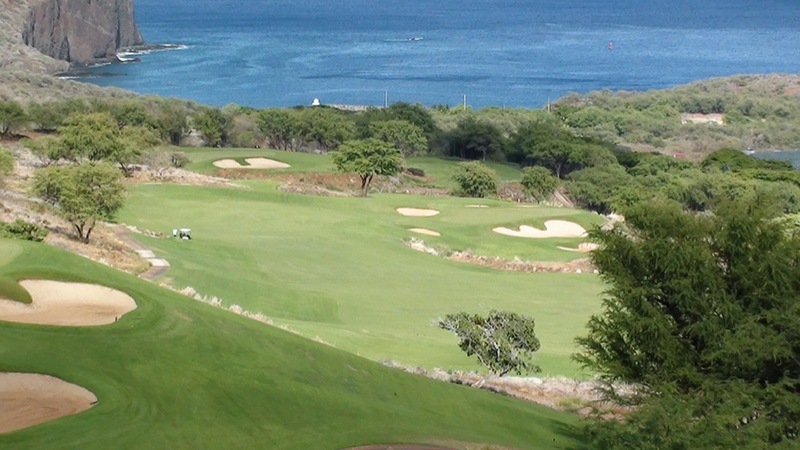 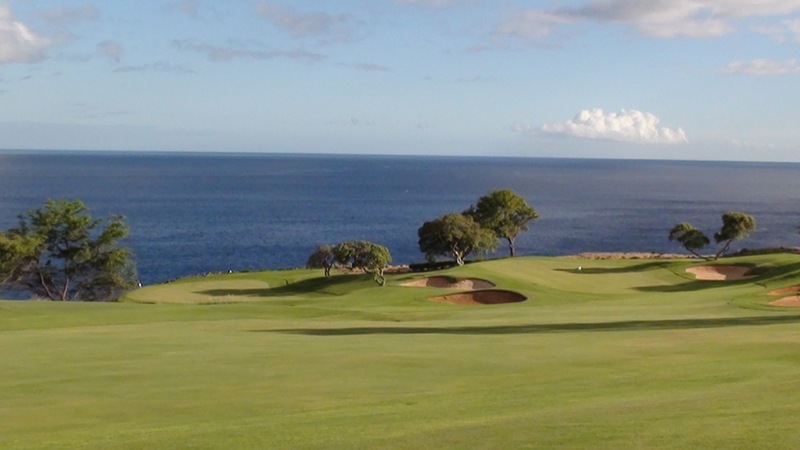 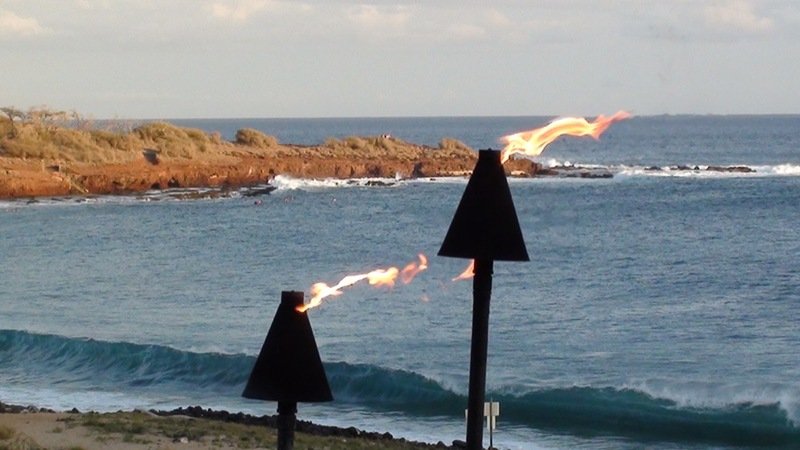 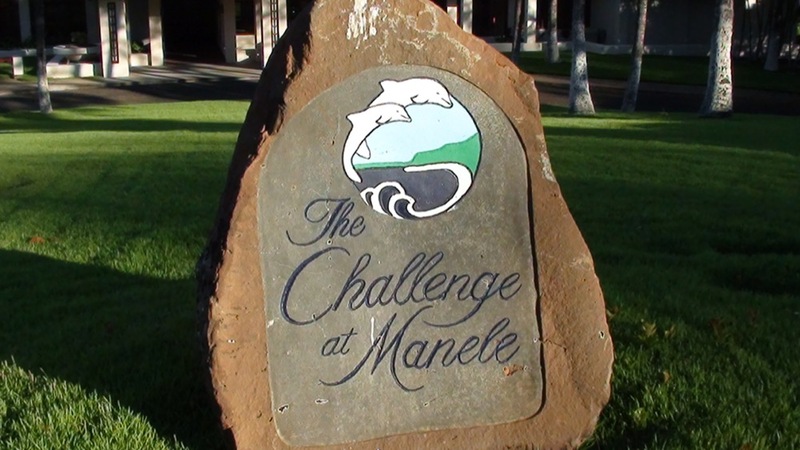 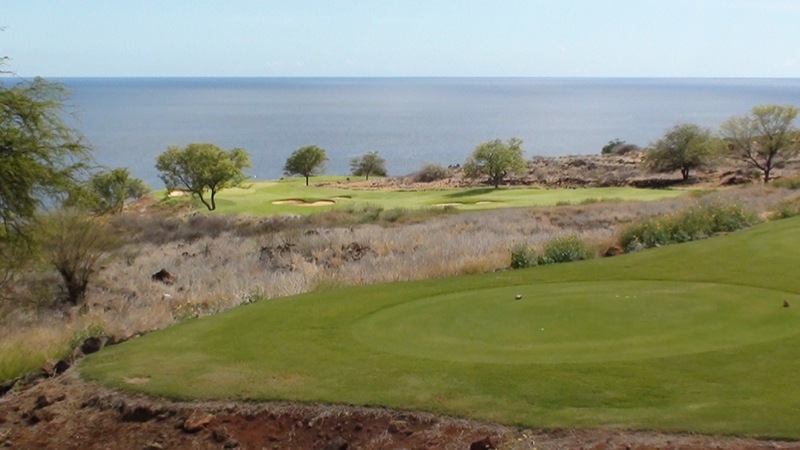 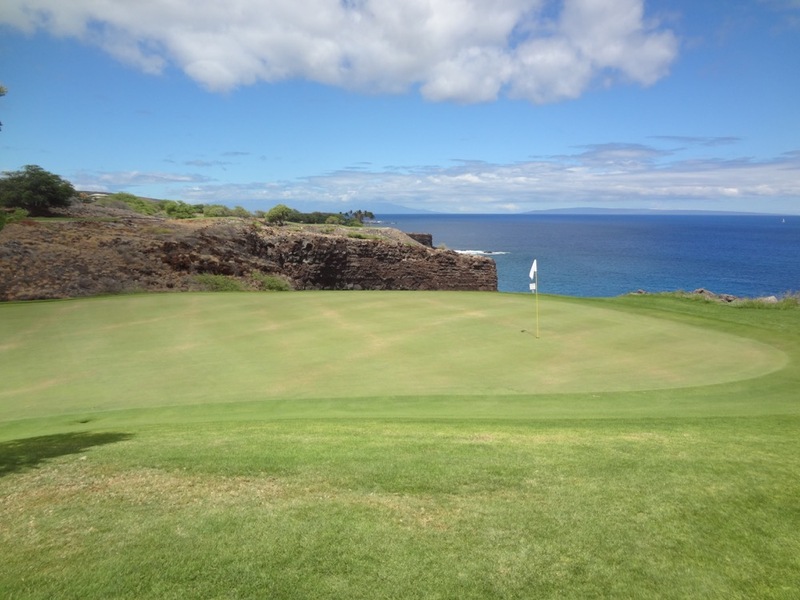 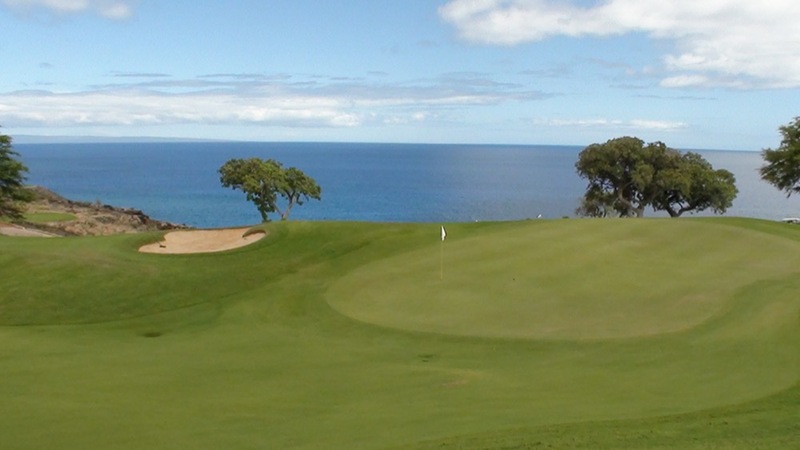 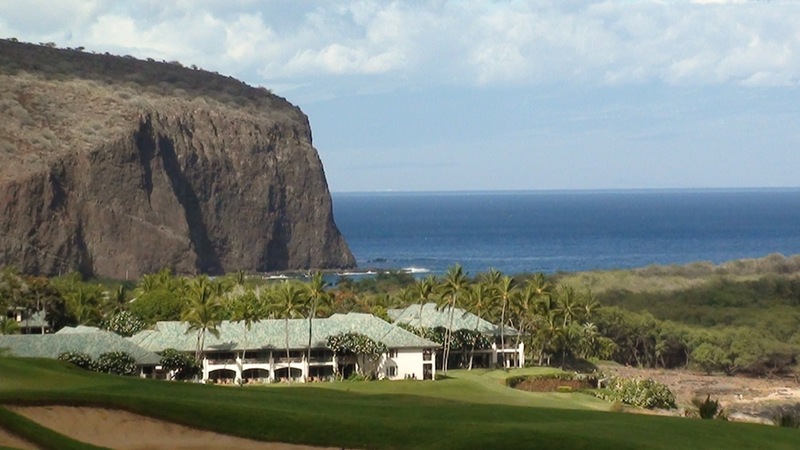 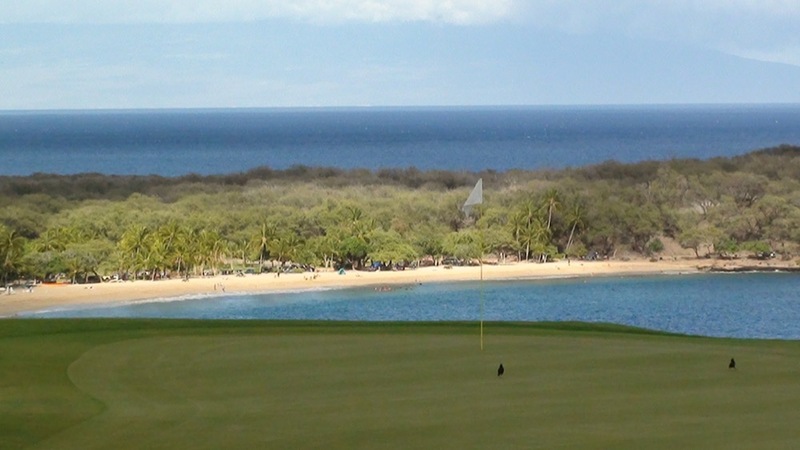 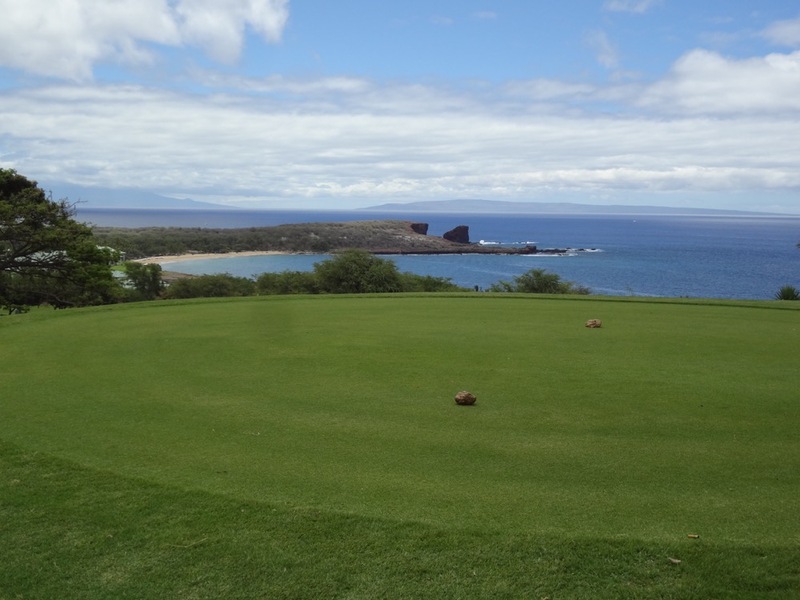 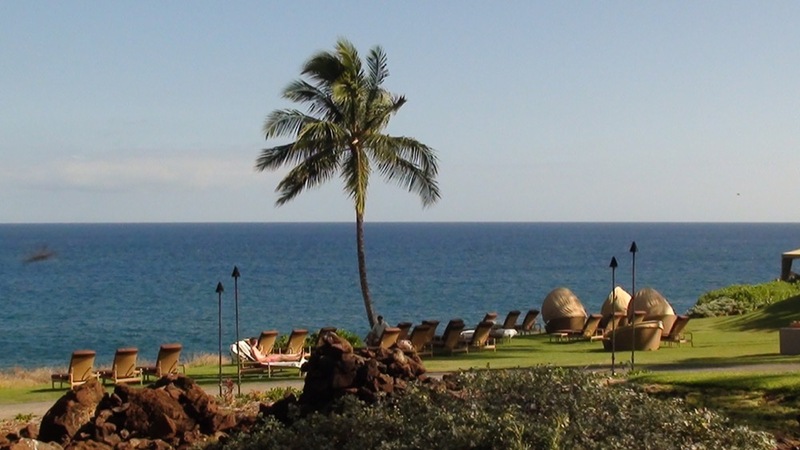 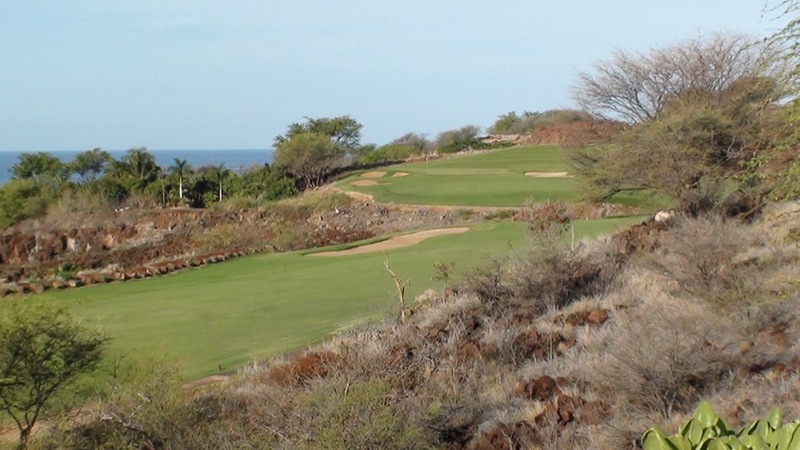 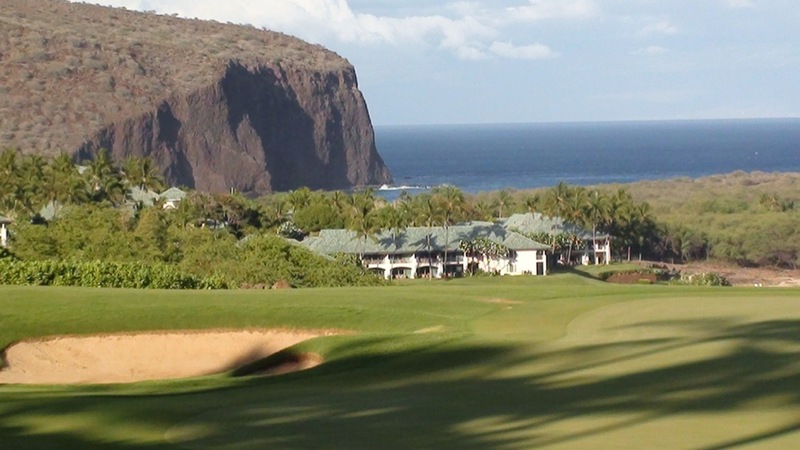 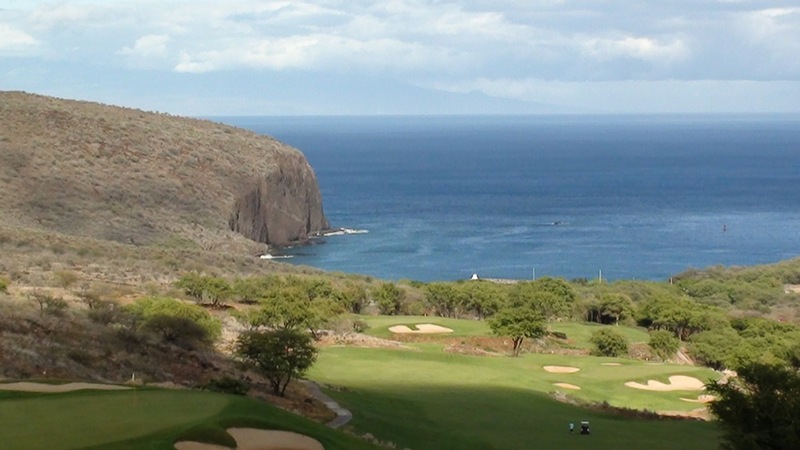 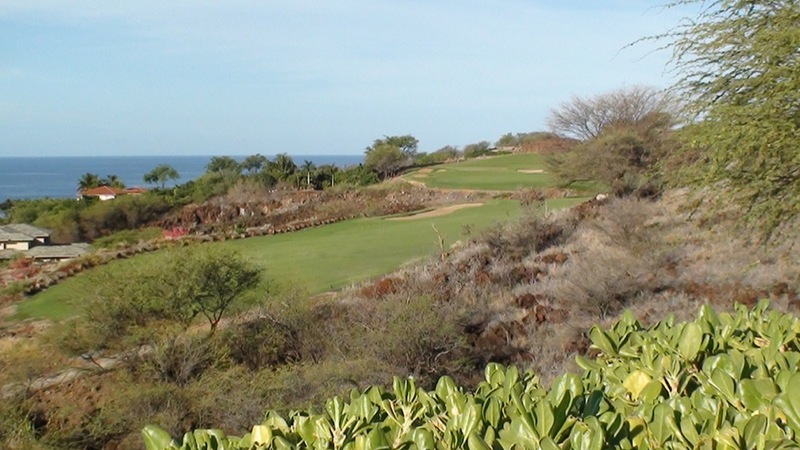 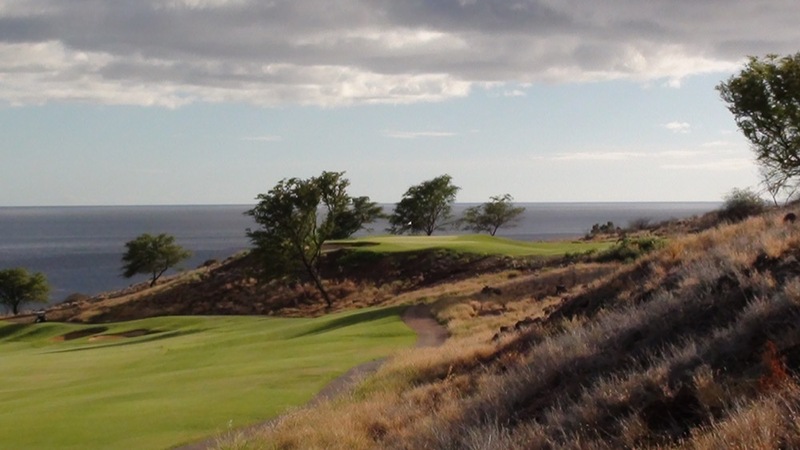 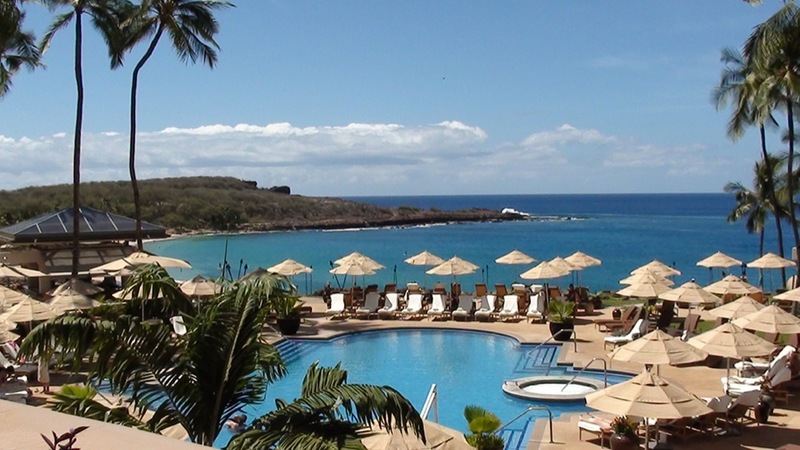 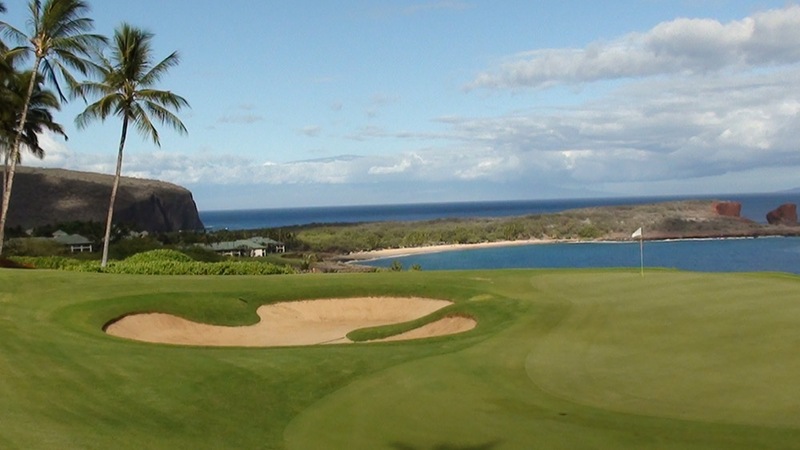 Every hole at Manele Golf Course offers spectacular ocean views with the whales plentiful especially in wintertime. 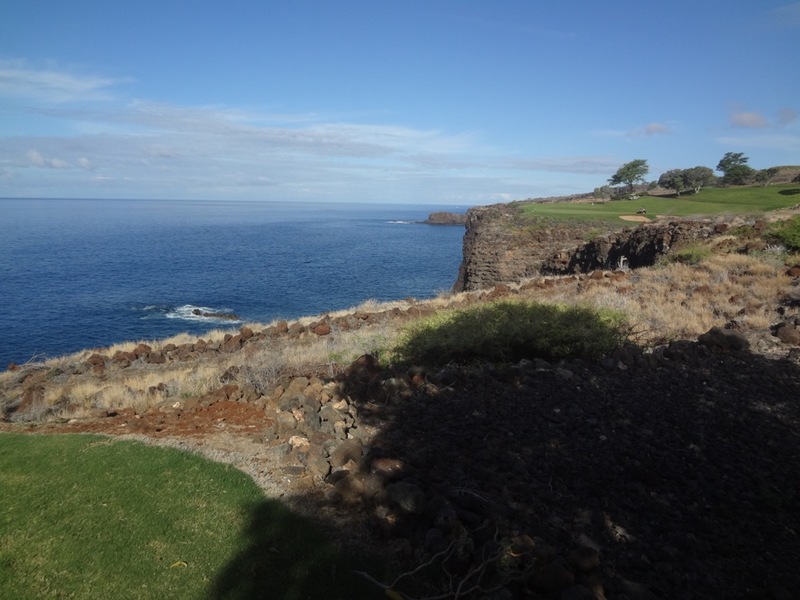 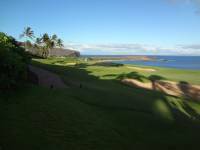 The highlight on the front nine is the view out to Manele Bay from the 5th fairway, high above Manele Golf Course’s 6th and the 7th which head directly out to the distant bay. 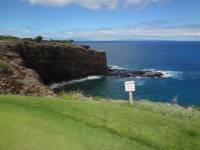 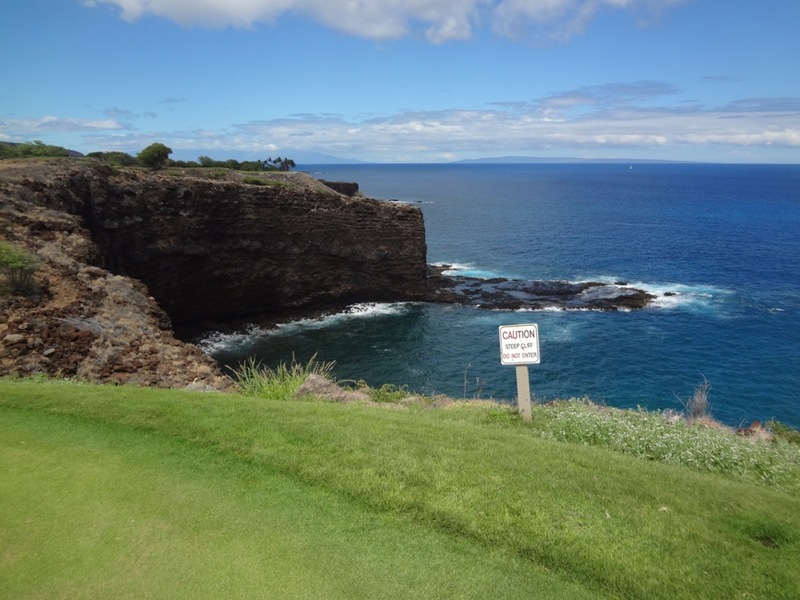 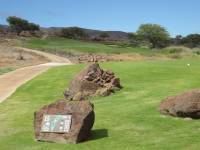 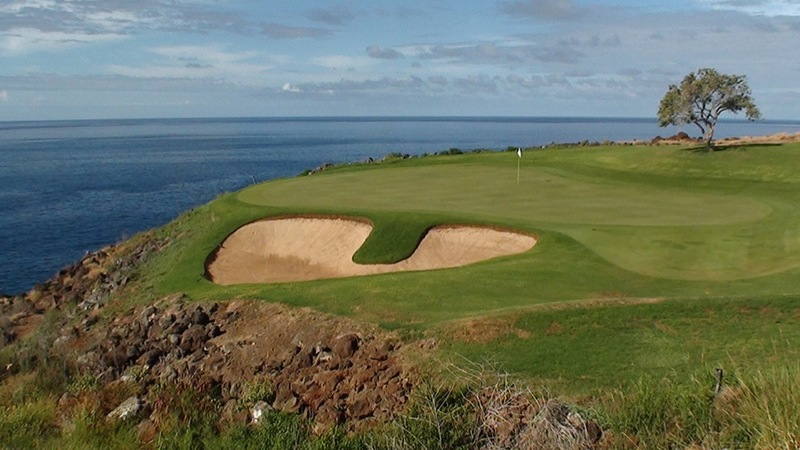 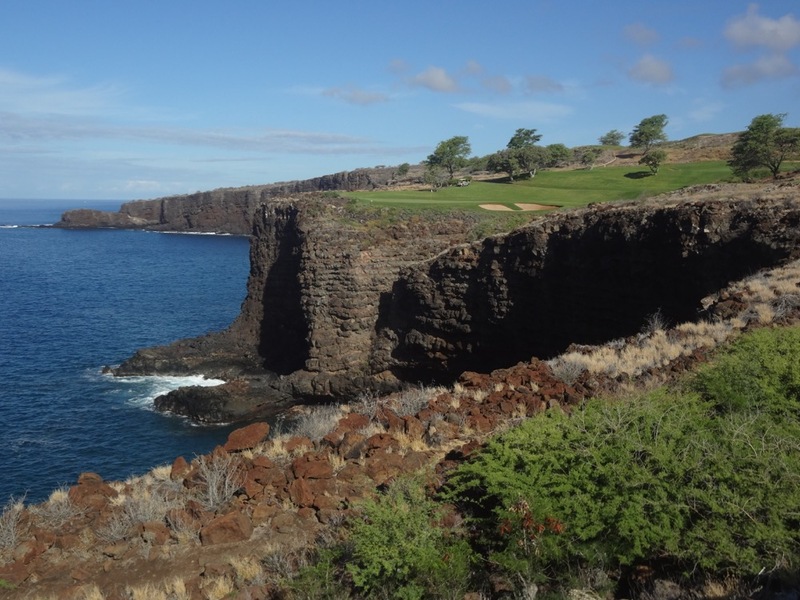 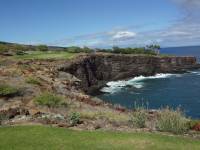 But Manele Golf Course will stay in the memory banks forever due to its three cliff top holes. 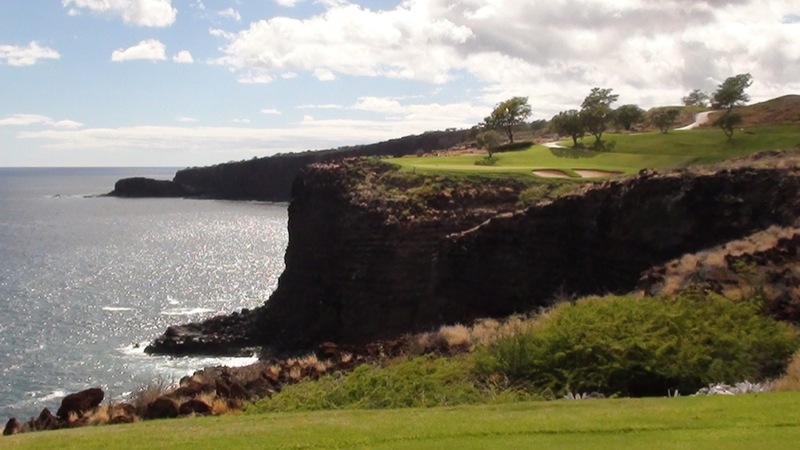 The first cliff top hole at Manele Golf Course is the heroic par-3 12th where the green is so high above the ocean that any ball short or left offers the golfer what can be considered cruel and unusual punishment—an additional 2 or 3 seconds of watching your ball fall to the Pacific depths. 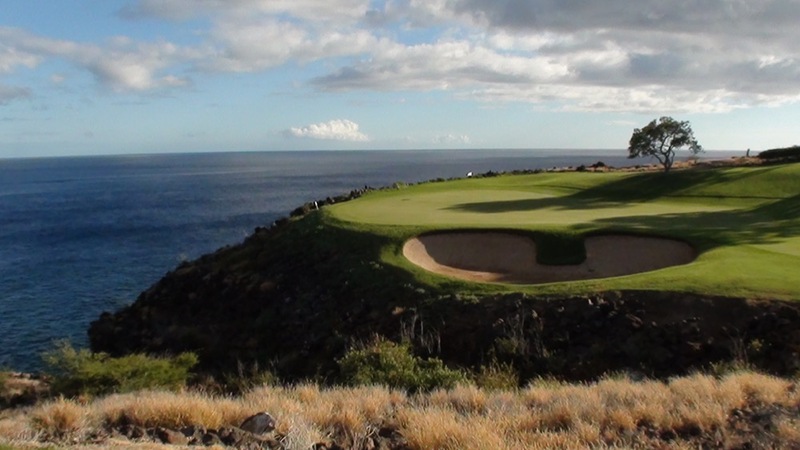 The 13th at Manele Golf Course is a beautiful par 4 continuing in the same direction, Pacific Ocean to the left, green perched right on top of it. 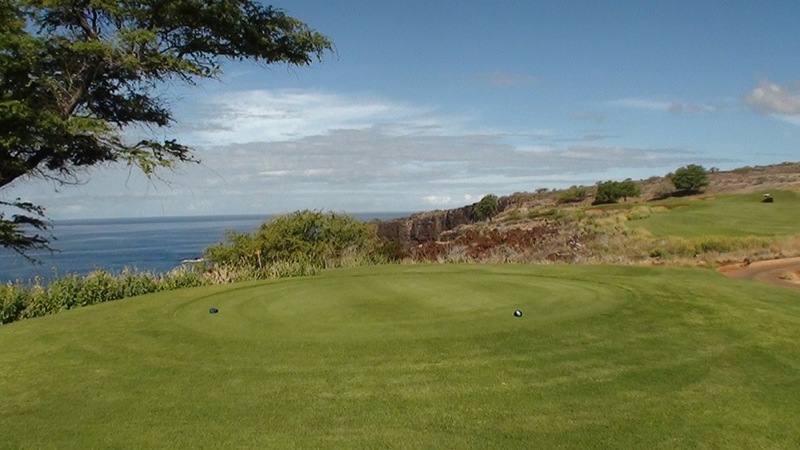 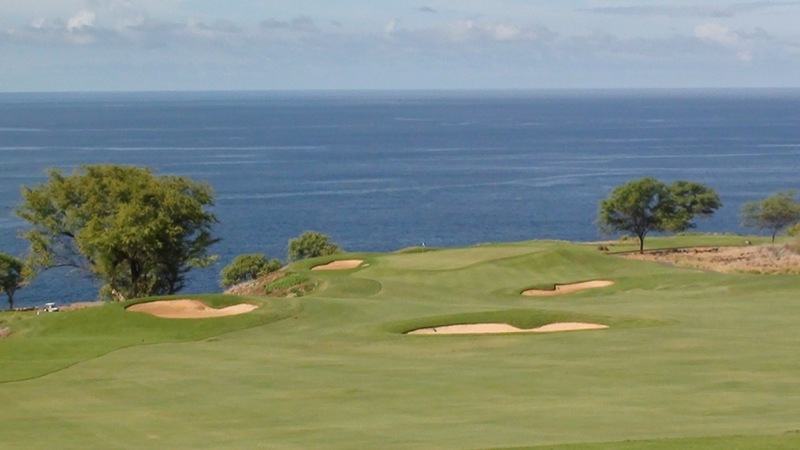 After these two back to back holes at Manele Golf Course you will think that it can’t possibly get better but that only lasts until the 17th tee where a stunning par 4 with the ocean on the right stares you down, and all you really see from the tee is a wall of black rock that must be carried and navigated. 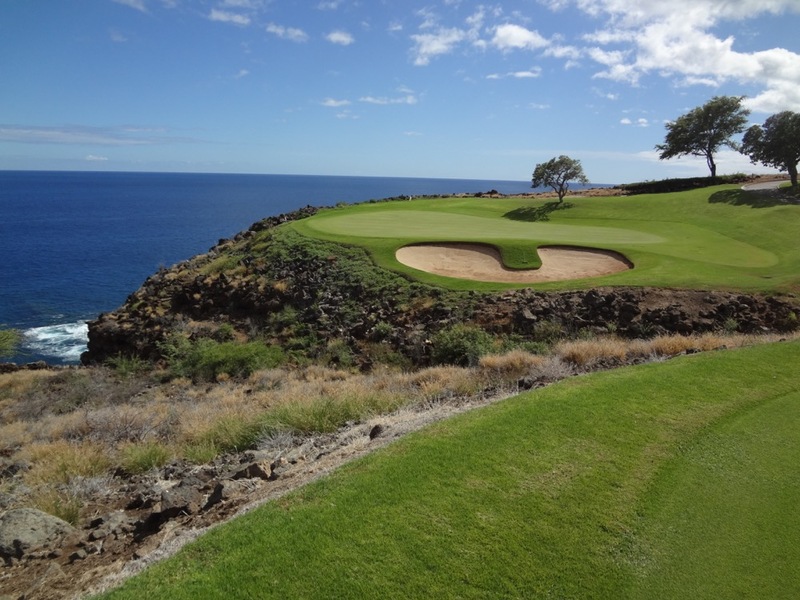 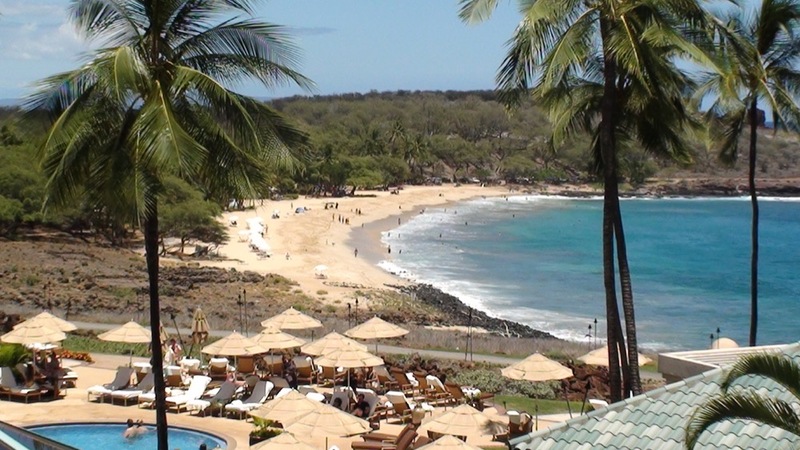 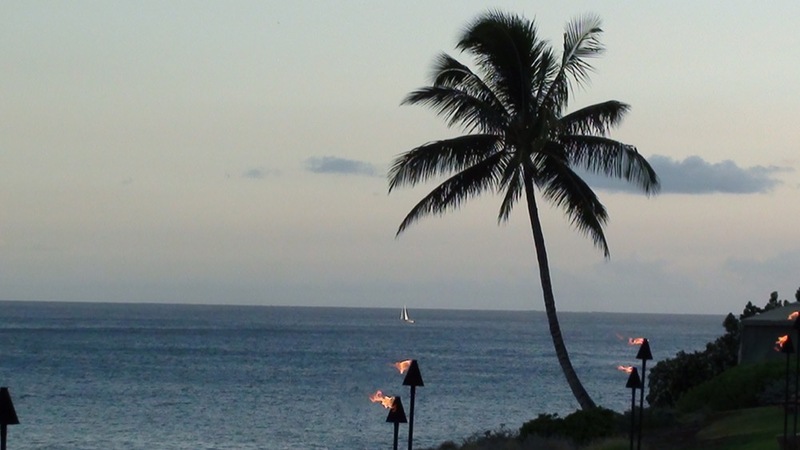 Manele Golf Course is one for the camera, and Manele Golf Course can easily be combined with Maui either as a day trip or better yet, come stay in the new Four Seasons Hotels on Lanai which are redefining luxury on the “private” Pineapple Isle of Lanai!